I love the stories and pastimes in the Krsna Book, and never tiring of hearing them. 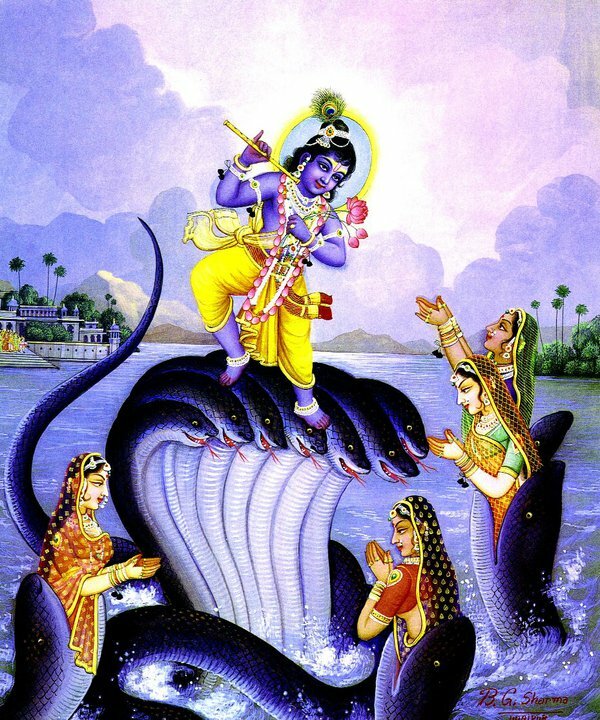 I ran across the above image on the Internet, I found it so sweet, that I opened up the Krsna Book and re-read the story of Krsna Subduing the Kaliya Serpent. 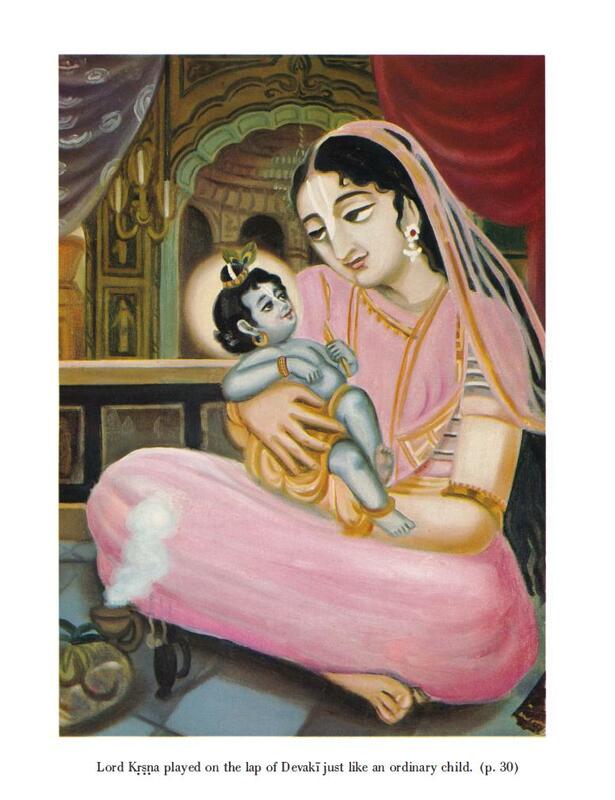 …When this story was being narrated by Śukadeva Gosvāmī, Mahārāja Parīkṣit became eager to hear more about Kṛṣṇa’s childhood pastimes. He inquired from Śukadeva Gosvāmī how Kṛṣṇa chastised Kāliya, who was living in the water for many years. 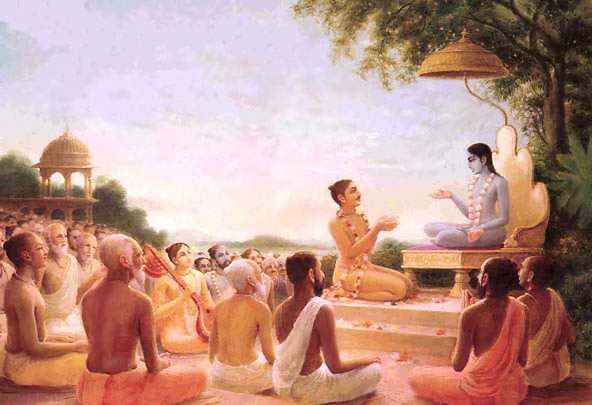 Actually, Mahārāja Parīkṣit was becoming more and more enthusiastic to hear the transcendental pastimes of Kṛṣṇa, and his inquiry was made with great interest. Śukadeva Gosvāmī narrated the story as follows. …The position of Mahārāja Parīkṣit and Śukadeva Gosvāmī is unique. 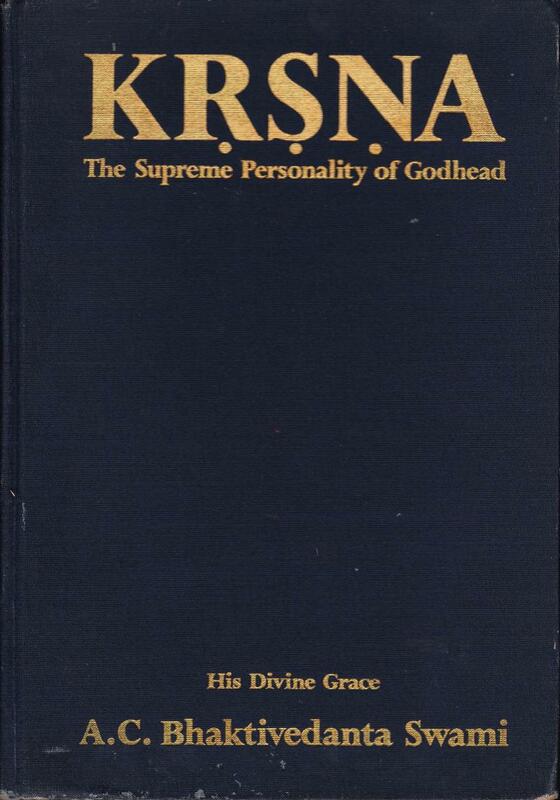 Mahārāja Parīkṣit is the right person to hear about the transcendental pastimes of Kṛṣṇa, and Śukadeva Gosvāmī is the right person to describe them. If such a fortunate combination is made possible, then Kṛṣṇa-kathā immediately becomes revealed, and people may benefit to the highest possible degree from such a conversation. This narration was presented by Śukadeva Gosvāmī when Mahārāja Parīkṣit was prepared to give up his body, fasting on the bank of the Ganges. In order to assure Śukadeva Gosvāmī that by hearing Kṛṣṇa-kathā he would not feel tired, Mahārāja Parīkṣit expressed himself very frankly: “Hunger and thirst may give trouble to ordinary persons or to me, but the topics of Kṛṣṇa are so nice that one can continue to hear about them without feeling tired because such hearing situates one in the transcendental position.” It is understood that one must be very fortunate to hear about Kṛṣṇa-kathā seriously, like Mahārāja Parīkṣit. He was especially intent on the subject matter because he was expecting death at any moment. Every one of us should be conscious of death at every moment. This life is not at all assured; at any time one can die. 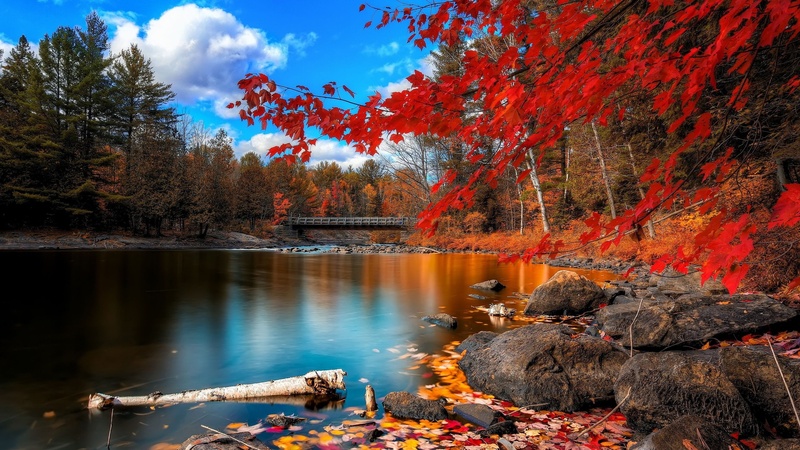 It does not matter whether one is a young man or an old man. So before death takes place, we must be fully Kṛṣṇa conscious. At the point of his death, King Parīkṣit was hearing Śrīmad-Bhāgavatam from Śukadeva Gosvāmī. When King Parīkṣit expressed his untiring desire to hear about Kṛṣṇa, Śukadeva Gosvāmī was very pleased. Śukadeva was the greatest of all Bhāgavata reciters, and thus he began to speak about Kṛṣṇa’s pastimes, which destroy all inauspiciousness in this age of Kali. 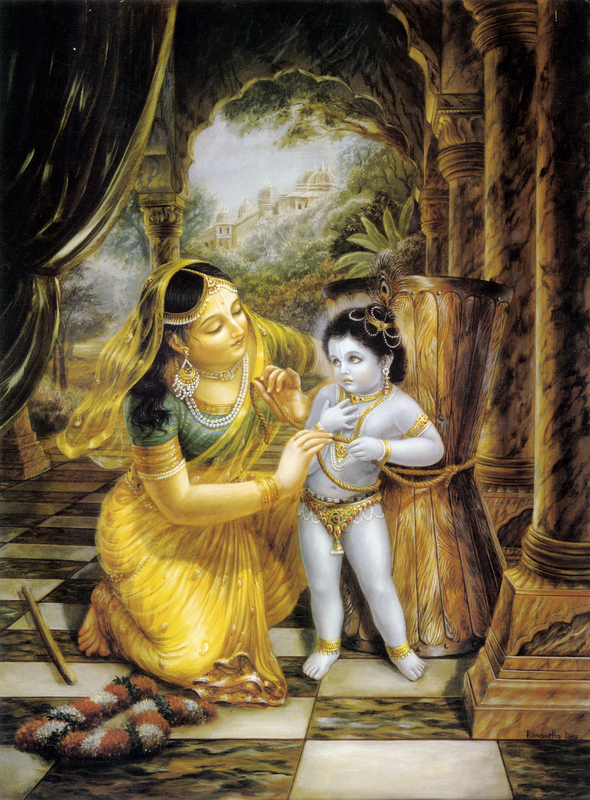 Śukadeva Gosvāmī thanked the King for his eagerness to hear about Kṛṣṇa, and he encouraged him by saying, “My dear King, your intelligence is very keen because you are so eager to hear about the pastimes of Kṛṣṇa.” He informed Mahārāja Parīkṣit that hearing and chanting of the pastimes of Kṛṣṇa are so auspicious that the processes purifies the three varieties of men involved: he who recites the transcendental topics of Kṛṣṇa, he who hears such topics, and he who inquires about Him. 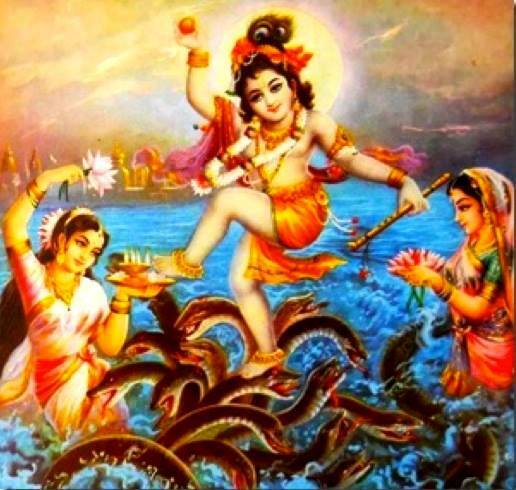 These pastimes are just like the Ganges water which flows from the toe of Lord Viṣṇu: they purify the three worlds, the upper, middle and lower planetary systems. Today being Purnima (the Full Moon), is also the End of Kartika, Sri Krsna Rasa-yatra (the purnima or full moon of Damodara month is the second full moon of the autumn season, and rasa lila is again celebrated), Tulasi-Saligrama Vivaha (this is the celebration of the marriage ceremony of Srimati Tulsi Devi and Lord Sri Krishna), and the Last Day of Caturmasya. 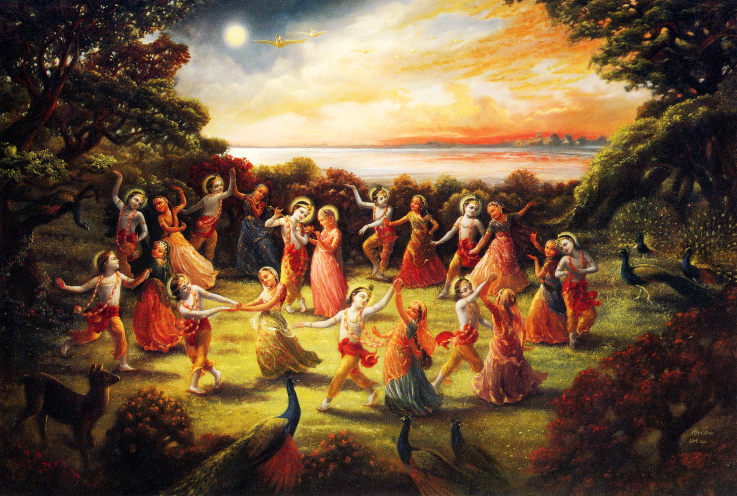 In honor of this auspicious day, we are posting the Introduction to the Rasa Dance, Chapter 29 of the Krsna Book. 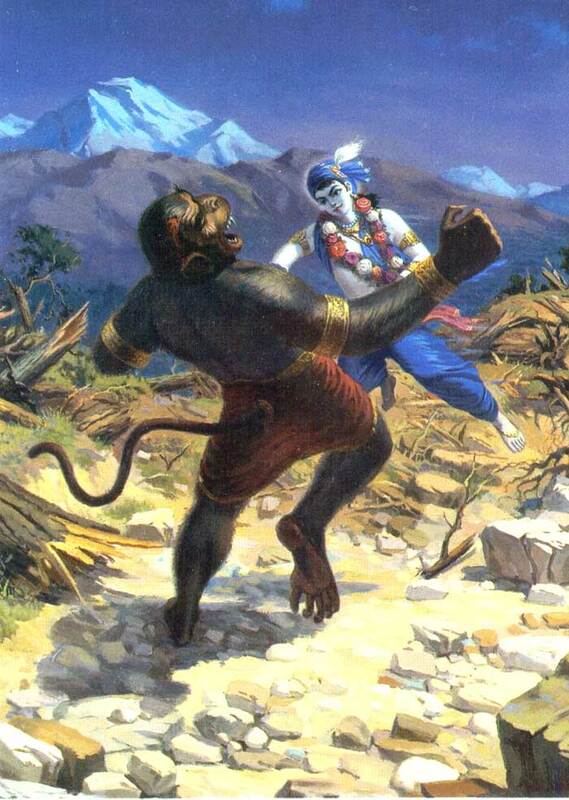 …The appearance of the moon increased Kṛṣṇa’s desire to dance with the gopīs. 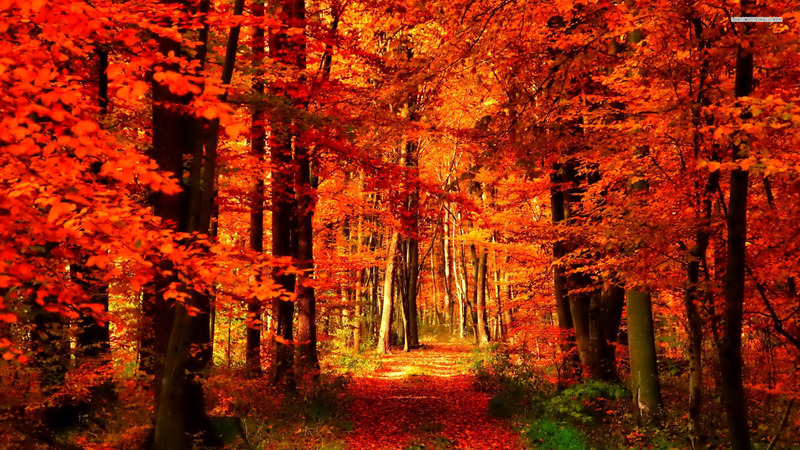 The forests were filled with fragrant flowers. The atmosphere was cooling and festive. 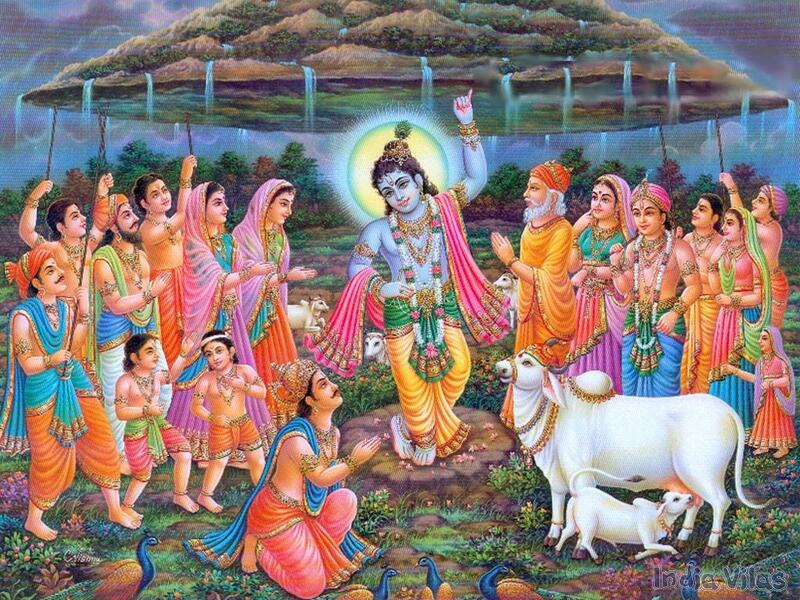 When Lord Kṛṣṇa began to blow His flute, the gopīs all over Vṛndāvana became enchanted. Their attraction to the vibration of the flute increased a thousand times due to the rising full moon, the red horizon, the calm and cool atmosphere, and the blossoming flowers. All these gopīs were by nature very much attracted to Kṛṣṇa’s beauty, and when they heard the vibration of His flute, they became apparently lustful to satisfy the senses of Kṛṣṇa. 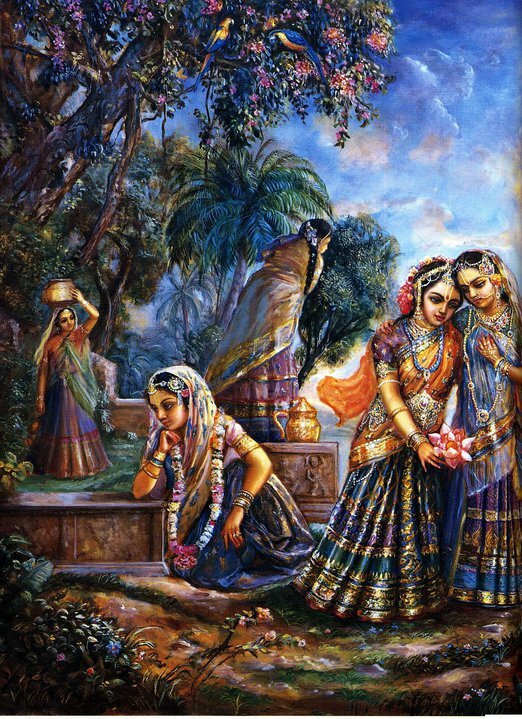 Immediately upon hearing the vibration of the flute, they all left their respective engagements and proceeded to the spot where Kṛṣṇa was standing. While they ran very swiftly, all their earrings swung back and forth. They all rushed toward the place known as Vaṁśīvaṭa. 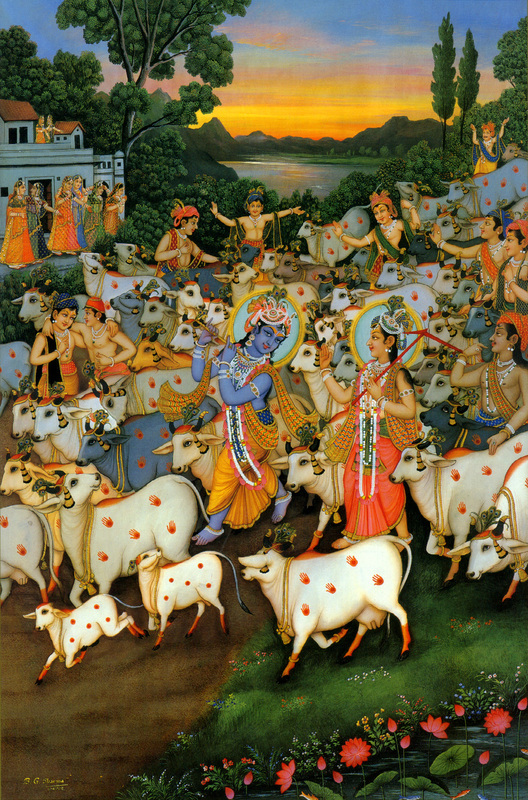 Some of them were engaged in milking cows, but they left their milking business half finished and immediately went to Kṛṣṇa. 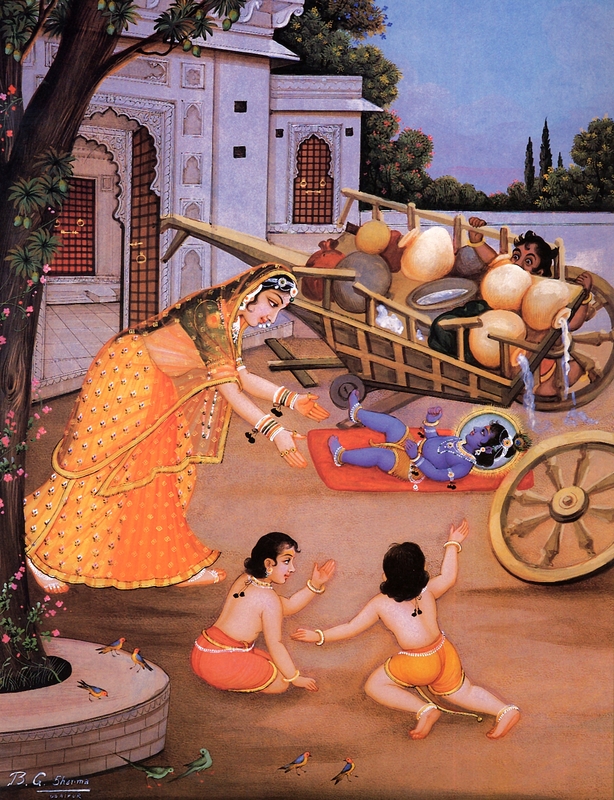 One of them had just collected milk and put it in a milk pan on the oven to boil, but she did not care whether the milk overboiled and spilled–she immediately left to go see Kṛṣṇa. 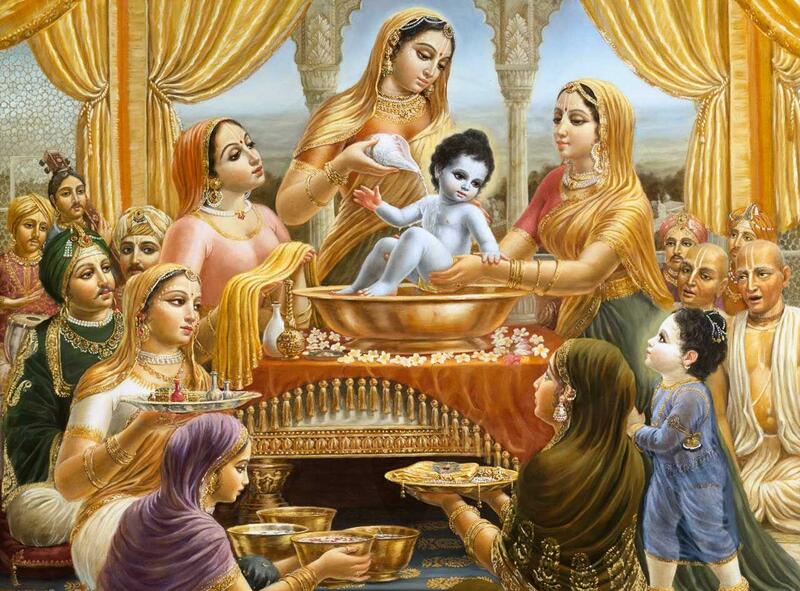 Some of them were breast feeding their small babies, and some were engaged in distributing food to the members of their families, but they left all such engagements and immediately rushed towards the spot where Kṛṣṇa was playing His flute. Some were engaged in serving their husbands, and some were themselves engaged in eating, but neither caring to serve their husbands nor eat, they immediately left. Some of them wanted to decorate their faces with cosmetic ointments and to dress themselves very nicely before going to Kṛṣṇa, but unfortunately they could not finish their cosmetic decorations nor put on their dresses in the right way because of their anxiety to meet Kṛṣṇa immediately. Their faces were decorated hurriedly and were haphazardly finished; some even put the lower part of their dresses on the upper part of their bodies and the upper part on the lower part. While all the gopīs were hurriedly leaving their respective places, their husbands, brothers and fathers were all struck with wonder to know where they were going. Being young girls, they were protected either by husbands, elderly brothers or fathers. All their guardians forbade them to go to Kṛṣṇa, but they disregarded them. When a person becomes attracted by Kṛṣṇa and is in full Kṛṣṇa consciousness, he does not care for any worldly duties, even though very urgent. Kṛṣṇa consciousness is so powerful that it gives everyone relief from all material activities. Śrīla Rūpa Gosvāmī has written a very nice verse wherein one gopī advises another, “My dear friend, if you desire to enjoy the company of material society, friendship and love, then please do not go to see this smiling boy Govinda, who is standing on the bank of the Yamunā and playing His flute, His lips brightened by the beams of the full moonlight.” Śrīla Rūpa Gosvāmī indirectly instructs that one who has been captivated by the beautiful smiling face of Kṛṣṇa has lost all attraction for material enjoyments. This is the test of advancement in Kṛṣṇa consciousness: a person advancing in Kṛṣṇa consciousness must lose interest in material activities and personal sense gratification.